It took me four years to get the information (on what his evidence was) from this guy who is the most obnoxious fanatical Evolution believer. Apparently he was "saved" from his Catholic upbringing by "science". I tried to tell him you don't need another religion to replace the one you didn't like. For some reason he really hates my educational materials and how I sometimes mock his religion of magical causes and mystical processes that have never been seen in any physical evidence. This is just about the easiest to refute as evidence for any form of “evolution”. This is the part of evolution that is nonsense "Evolution: "that theory which sees in the history of all things organic and inorganic a development from simplicity to complexity, a gradual advance from a simple or rudimentary condition to one that is more complex and of a higher character." Webster's Encyclopedic Dictionary of the English Language. " Atrophy is evidence against evolution and absolutely clear evidence towards atrophy and anti-evolution. If a feature was there and now it is gone is a sign that creatures were more advanced with more physiological features used for survival that are now not used any more. In order to show “evolution” or progress towards the more advanced or more complex you need to show features which are developing. The meaning of atavism is “anatomical and molecular vestiges”. So for someone to imply that these are separate "things" in their "long list of reasons" is silly. I mean really pathetic and shows they need this for emotional reasons. Saying the same thing two and three times as evidence as if these "things" were different. This is easy to refute. Any feature that reoccurs from the past is not new. If an Atavism is triggered it is still not new. In order to show any form of evolution, you must show NEW features that made themselves from coding that has never existed. This is more "proof" of anti-evolution or degeneration as is shown in all DNA evidence. "the development of defects in an embryo"
"the failure to develop some part or organ"
"the process of growth in plants"
"the science that studies living organisms"
Again this only talks about existing traits developing within the live creatures. In order to show evolution you must show only NEW traits developing that have never been seen in any of the species ever at any time in history. In DNA this is the idea that any showing of similar DNA "automatically is evidence" for genetic linking from the original parent of all species the great granddaddy of all life. This part of this science is full of inferences. For instance there is a tiny and I mean tiny segment of DNA found in one species of fish that is similar to humans. So this is automatically believed as evidence that we evolved from fish. There are only 20 amino acids to make life cells with. The odds of the design showing redundant use of the same type of cells to make "muscles" for instance, is about 100% with NO genetic connection at all. Muscles require a type of protein cell that contracts in response to impulses from nerves. There isn't many ways to make that. This does not warrant any further discussion at all. It is ridiculous crap "pseudo science" and a stretch of the imagination. It goes along with the idea that fools think that any similarity of use, appearance can only mean a direct genetic linage link. This is utterly ridiculous and in fact all that I have seen of this idea in fossils of the "ancient version" of the creature are shown to have far more usable features and the "homology" becomes more complex as you go back in time. It is evidence of anti-evolution or the continual degradation of all species. 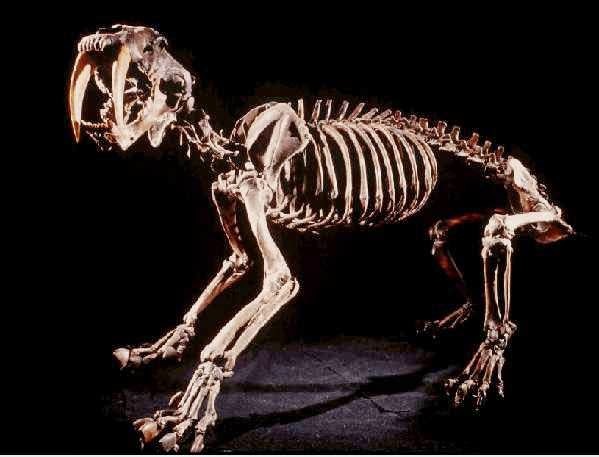 Here is a photo of the ancient saber tooth tiger the "determined" parent of the cat species, by "homology". It looks like a cat but it is far more powerful, far more able to survive and has many more features that modern cats, lions, tigers, leopards, panthers and all the cats. Many of the "cats" devolved from this amazingly far more complex life form. If it was not fit to stay alive and reproduce we would not have modern cats. The Saber Tooth Tiger "evolved" into the Leopard below. Which one is stronger with more teeth better fitness? The Leopard has reached the end of its genetic viability and is going extinct. This is because there is only genetic degradation leading to eventual extinction found in all evidence. When a creature has anti-evolution and is degrading in its complex functions as is shown in ALL the evidence you will see what I call genetic and physical splits. This happens when the creatures do what is known as "speciation". They split off from the original family of the parent of the genetic lineage. You have to go backwards with this in time to realize that the parent of all speciation splits was much stronger, the parent creature of all speciation in any lineage was more complex and far more advanced in terms of survival and genetic features for survival. The horse is another example. You will notice that the oldest of the "horse" as it is believed to be from paleontology and what they think is the ancient horse, that this creature has far more complex bone structure in its legs. As it goes along to the "modern" horse it has lost many bones and flexibility in the legs. This has cause the horse to be more limited, rather than more complex. Even the ancient teeth look better. NOTE: This one is so damned funny that I had to quote the site that all the Evotards use for this. In the first paragraph they clearly define "anti-evolution" or loss of good genetic engineering as the creatures "degrade" from the more "optimal" to the "sub-optimal". This is the some of the most compelling evidence for anti-evolution or gradual degrading of the best genetic engineering to the more defective genetic engineering we see today that I have ever seen and that we can see today. The famous "The Left Recurrent Laryngeal Nerve" is totally evidence for genetic degradation. See the video below. These people are "nuts" by the way in not being able to see the obvious, because they are brainwashed into seeing things backwards. Evolutionary opportunism also results in suboptimal functions and structures. As stated before, in gradually evolving a new function, organisms must make do with what they already have. Thus, functions are likely to be performed by structures that would have been arranged differently (e.g. more efficiently) if the final function were known from the outset. "Suboptimality" does not mean that a structure functions poorly. It simply means that a structure with a more efficient design (usually with less superfluous complexity), could perform the same final function equally well. Suboptimal structures and functions should have a gradualistic, historical evolutionary explanation, based on the opportunistic recruitment of ancestral structures, if this history is known from other evidence (e.g. if this history is phylogenetically determined by closely related organisms or fossil history)." The left recurrent laryngeal nerve is used to sell evolution as a source of how things are refined. We don't have any extremely ancient humans to look at so we don't know how this degerated and although fully functional and works great, as we can tell by singers such as Pavarotti and many thousands of singers. Now consider that this is completely from opinions from believers that this is some evidence for evolution? This is a real human body from a medical website where doctors are trained. It goes down then back up. The LEFT RECURRENT LARYNGEAL NERVE loops beneath the arch of the aorta to recur (ascend) to the larynx of which it supplies. This guy is so convinced that this shows a horrible designer. But he has no evidence of the condition of humans back at the beginning. We are looking at what is believed to be "millions of years" of degeneration speciation and reduction in fitness. So defects are now normal. It is all in your emotional beliefs that you want to believe and this is not even evidence, because it is so speculative. But looking at all the evidence combined, it is clearly evidence of a decline in human health. My other favorite video on this is this one. Where the famous, God and Religion Hater, Richard Dawkins shows us how stupid the giraffe is made. The assumption with the Giraffe is that it once had a short neck, but there is no fossil evidence of this. And even if it did have a short neck and this is the "poster child" for evolution then we have more evidence of a better design that degraded. And the other part is: Who is allowed to determine what is sub-optimal? Humans barely can wipe there asses and yet we can play "science gods". I clearly mean that this idea that humans can determine what is good and what is bad, is like an amoeba trying to do calculus. I notice with interest that your definition of Evolution: "that theory which sees in the history of all things organic and inorganic a development from simplicity to complexity, a gradual advance from a simple or rudimentary condition to one that is more complex and of a higher character." Webster's Encyclopedic Dictionary of the English Language. " It's almost as if u are sharing your erroneous definition in a fact free echo chamber. Care to link to the dictionary entry where this incorrect definition is given? Or shall I assume you guys have strawmanned it once again? So, you have never been given the truth of the matter before. This Evodelusionism religion is nothing more than a political tool to placate people while your government and plutocrats don't give a darn about you your children or how sickly humans have become from greed, war, diseases, and division. I wish you well but you are completely ignorant of what is going on on earth. You see..... When their theory was failing in the 1980's these moron believers reacted by changing definitions. The word evolution is only meant to be a positive advancement, not genetic degradation leading to extinction as is found in ALL physical evidence. Changing definitions of words that have had the same meaning for 400 years is evil. + even if it had been a definition by "the seat of his pants"
Ask God to reveal himself to you & to allow Jesus into your life if he wants to.